Reduced cutting time from 146 min to 28 min! 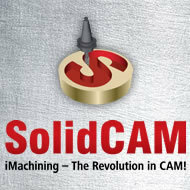 They were very impressed by the ease and speed of programming of the part..
We use the new [SolidCAM®] iMachining® techniques for roughing now – full depth and full flute-contact cutting. I’m a big fan of this. It is a lot quicker and the tools last longer – and it’s easier on the machines. Show them iMachining live on their machine - cut one big Titanium part - result was really good. They make parts for Civilian & Military Aircraft, Space Rockets..